I have in my hands a pair of English shoes. I’ve had them over 20 years and they’ve just come back from the factory in Northampton, where they’ve been repaired for the 3rd time. No, that’s wrong. They’re not like new, they’re better than new. They look and feel fantastic. They’ve creases of comfort, like smile lines for shoes, and the leather, a uniform light tan at time of purchase, has patinated in places to a darker, richer brown. But the leather still shines because I polish and buff them before use, and I maintain the structure through disciplined use shoes trees. The soles I replenish regularly. Always look after the sole. With attention and investment they still have many, many miles on the clock to come. They get better and better with each passing year. Seems like a useful metaphor for us. We should be increasing our value as we age, not the reverse. Yet I see so many tired looking shoes, perhaps reflecting their owners, worn and unpolished, cracked before their time. For goodness sake, don’t be in this group. In other words, if you’re 40, you invest in 40 hours of personal-development that year. It’s counter-intuitive I know but isn’t it fantastic? The older you get, the more you invest in yourself. You should be an increasingly greater object of interest. Gaining more attention, income and energy. All of that sounds pretty good to me. Now, I’m off to a course on consumer purchasing psychology. I’m interested in it, and I want to help my customers stand out in the minds of their customers. I hope you’re going the same. 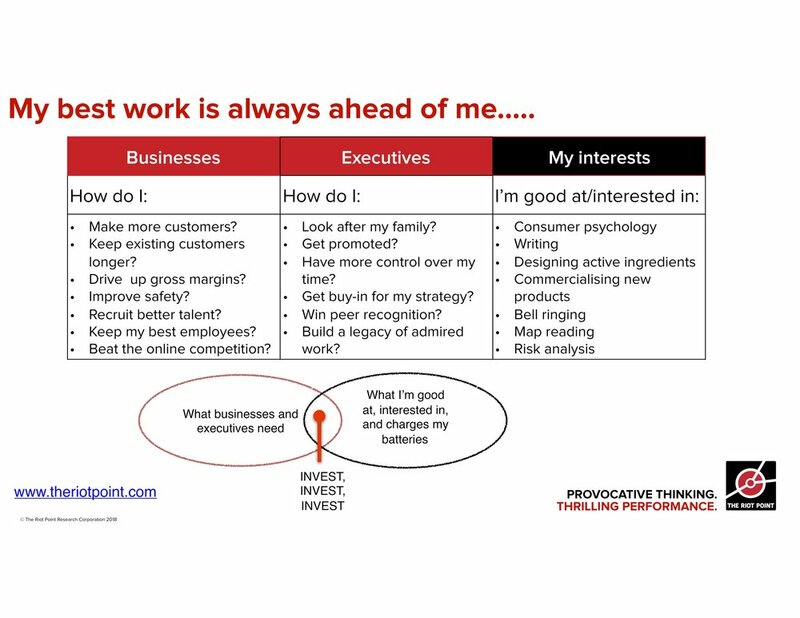 If you want to increase your return on personal investment, download this template. I’ve listed some of the challenges and questions I hear in businesses everyday, and some of the things you could to answer them—-while charging your batteries (and making a better living) at the same time. As ever, if you think some one will benefit from this idea, share the love.